Whether used for a hangar wash rack, outdoor aircraft wash rack, Bird Bath/ CWRS, tactical rinse system (TRS), EST aircraft wash water filtration systems are designed with the military's needs in mind. Designed to meet UFC treatment system and Air Force TO specifications, EST provides turnkey solutions. All systems feature remote monitoring for water quality, including PH, TDS (total dissolved solids), TSS (total suspended solids) and optional monitoring of TPS (total petroleum hydrocarbons), chlorides and other water quality levels. All systems feature stainless steel filtration components and high quality industrial pumps. EST systems are designed to filter out water from washing aircraft utilize a multi stage coagulation, flocculation, chemical adjustment and media and absolute filtration technologies. EST has extensive experience designing, installing and servicing aircraft water filtration systems. These small treatment plants replicate larger proven technologies from the industrial waster water treatment sector. Systems feature 100% stainless steel tank construction, stainless steel static mixers, automatic sludge removal from coagulation flocculation process, multi-layer industrial filters and zero bypass absolute filtration. Absolute filtration is utilized to ensure particulate do not blind over multimedia filters and the ion exchange system. Multiple filters with sand / gravel mixtures, activated carbon and Organoclay are used to remove additional solids, oils, heavy metals and other containments following the coagulation flocculation process. Ion exchange is utilized to remove chromium during the final stages of filtration, which guarantees toxic and carcinogenic hexavalent chromium (Cr+6 is a major containment in aircraft wash water) is removed. Sludge generated during the coagulation flocculation process is automatically removed utilizing built in automatic conveyors incorporated into the RTS 5000C. Sludge is automatically removed from the stainless steel tanks and deposited into 55 gallons metal drums for easy disposal. Operators and maintenance personal are able to safely exchange drums without coming into contact with hazardous material. *Other manufacturers are not able to effectively remove sludge without creating a large slurry discharge. Clear water rinse system and Bird Bath water filtration systems feature large inground or above ground water storage tanks designed to accommodate large volumes of water (10,000+ gallons.) 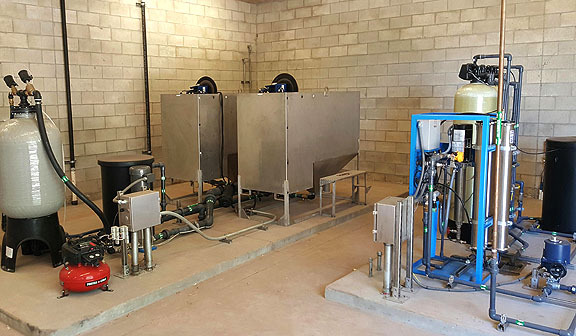 The system features advanced water quality monitoring systems, large valving and pumping equipment, along with industrial filtration components. Systems requiring closed loop operation call for additional filtration technologies to meet stringent aircraft water quality requirements. EST engineers systems to meet Air Force TO 1-1-691 (cleaning and corrosion prevention and control, aerospace and non-aerospace equipment) rinse requirements.